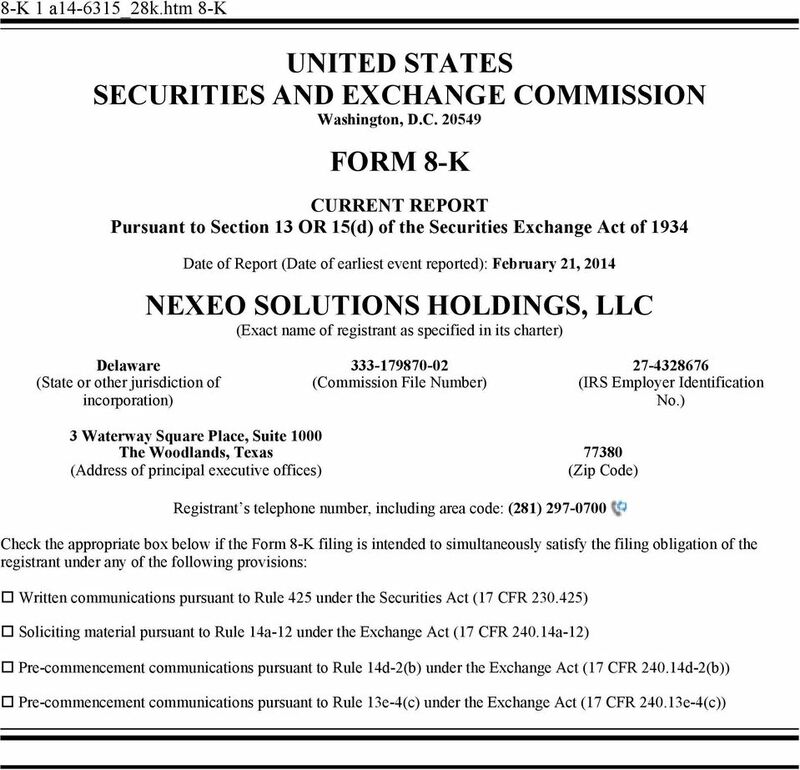 Download "UNITED STATES SECURITIES AND EXCHANGE COMMISSION FORM 8-K NEXEO SOLUTIONS HOLDINGS, LLC"
17 EXHIBIT A FORM OF TERM B-3 NOTE $ [New York, New York] [Date] FOR VALUE RECEIVED, the undersigned (the Borrowers ) hereby promise to pay, on a joint and several basis, to [LENDER] or its registered assigns (the Lender ) in accordance with Section of the Credit Agreement (as defined below), in lawful money of the United States of America in immediately available funds at the office of the Administrative Agent (such term, and each other capitalized term used but not defined herein, having the meaning assigned to it in the Credit Agreement, dated as of March 9, 2011, as amended and restated on October 16, 2012, as amended by Amendment No. 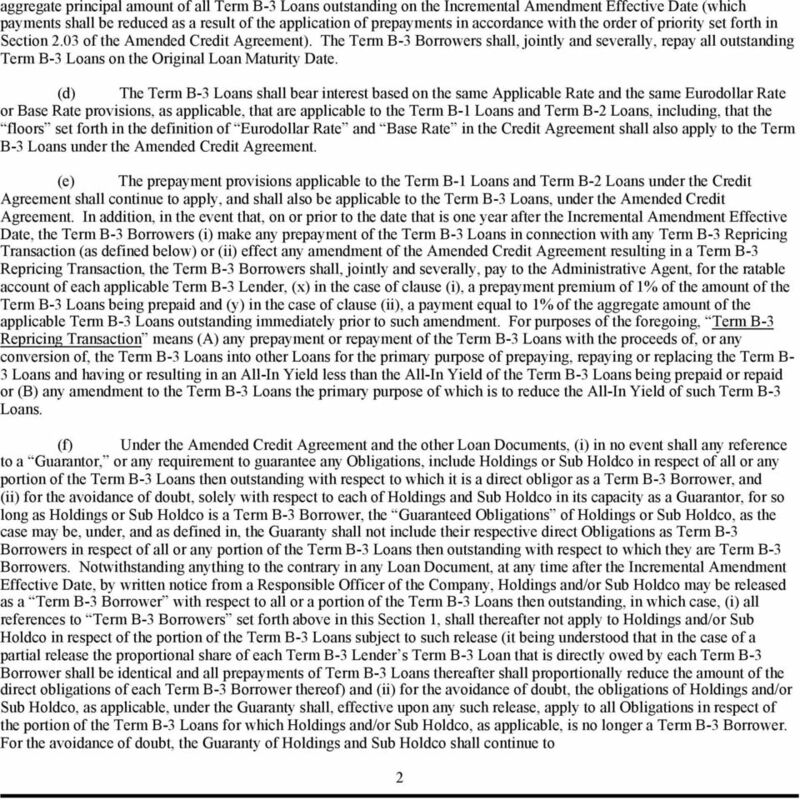 1 thereto, dated as of November 29, 2012, as amended by Amendment No. 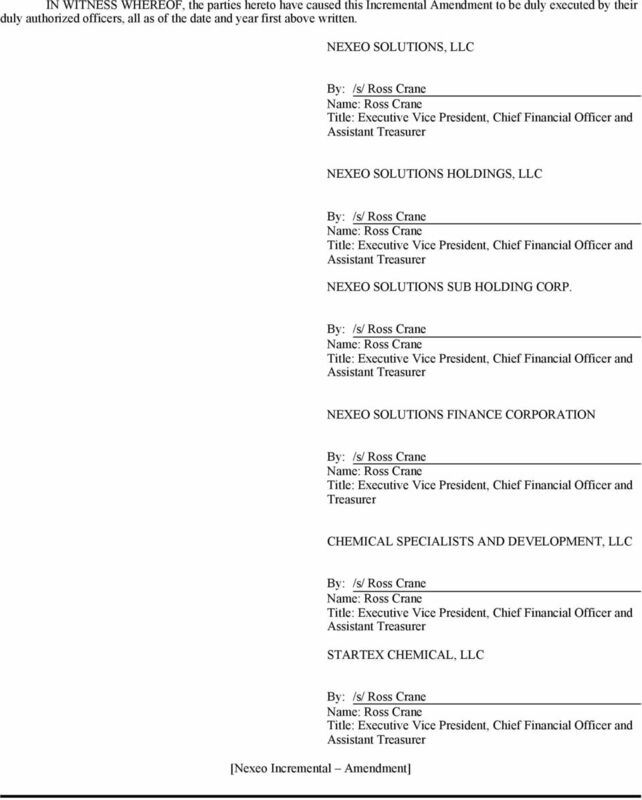 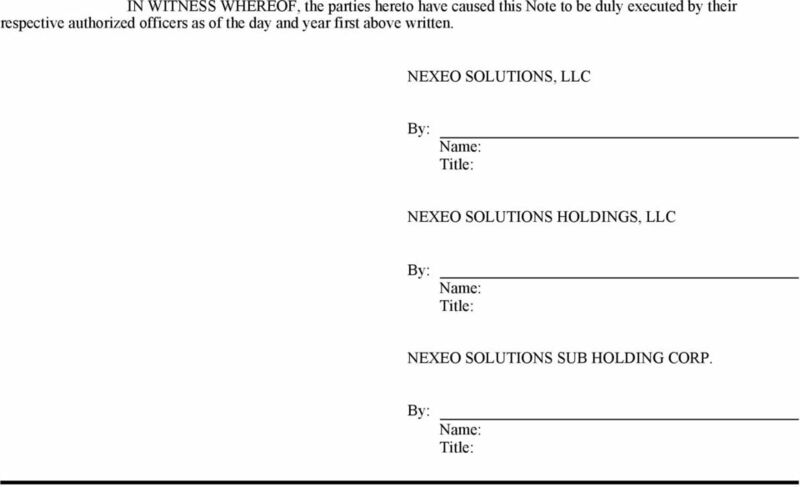 2 thereto, dated as of August 5, 2013, and as further amended by the Incremental Amendment, dated as of February [ ], 2014 (as amended, restated, extended, supplemented or otherwise modified from time to time, the Credit Agreement ), among Nexeo Solutions, LLC, a Delaware limited liability company, Nexeo Solutions Holdings, LLC, a Delaware limited liability company, Nexeo Solutions Sub Holding Corp., a Delaware corporation, the Lenders from time to time party thereto, and Bank of America, N.A., as Administrative Agent and Collateral Agent) at 1455 Market Street, Mail Code: CA , San Francisco, CA 94103, (or such other office notified by the Administrative Agent to the Borrower in accordance with Section of the Credit Agreement) (i) on the dates set forth in the Credit Agreement, the principal amounts set forth in the Credit Agreement with respect to Term B-3 Loans made by the Lender to the Borrowers pursuant to the Credit Agreement and (ii) on each Interest Payment Date, interest at the rate or rates per annum as provided in the Credit Agreement on the unpaid principal amount of all Term B-3 Loans made by the Lender to the Borrowers pursuant to the Credit Agreement. 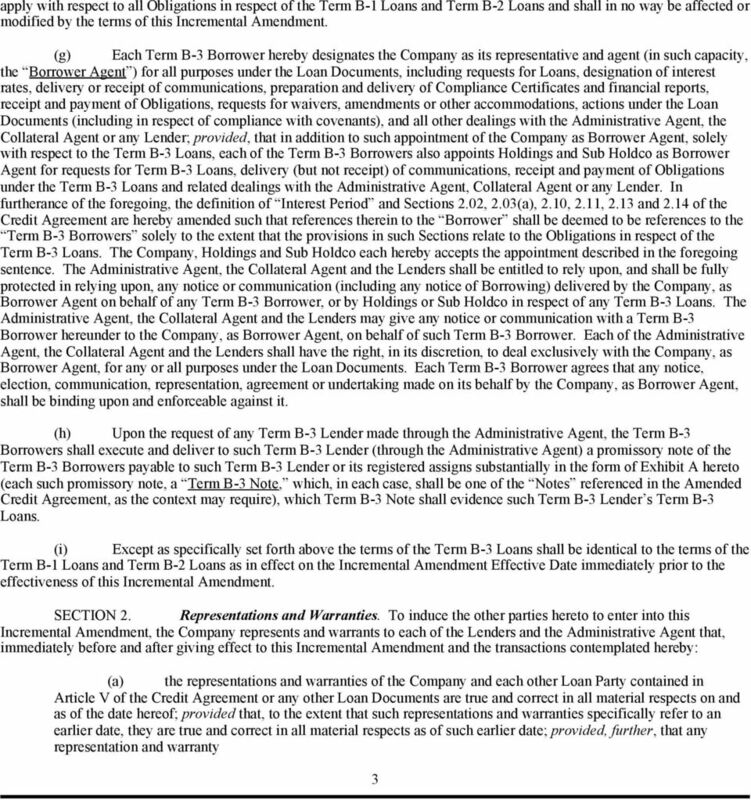 The Borrowers promise to pay, on a joint and several basis, interest, on demand, on any overdue principal and, to the extent permitted by law, overdue interest from their due dates at the rate or rates provided in the Credit Agreement. 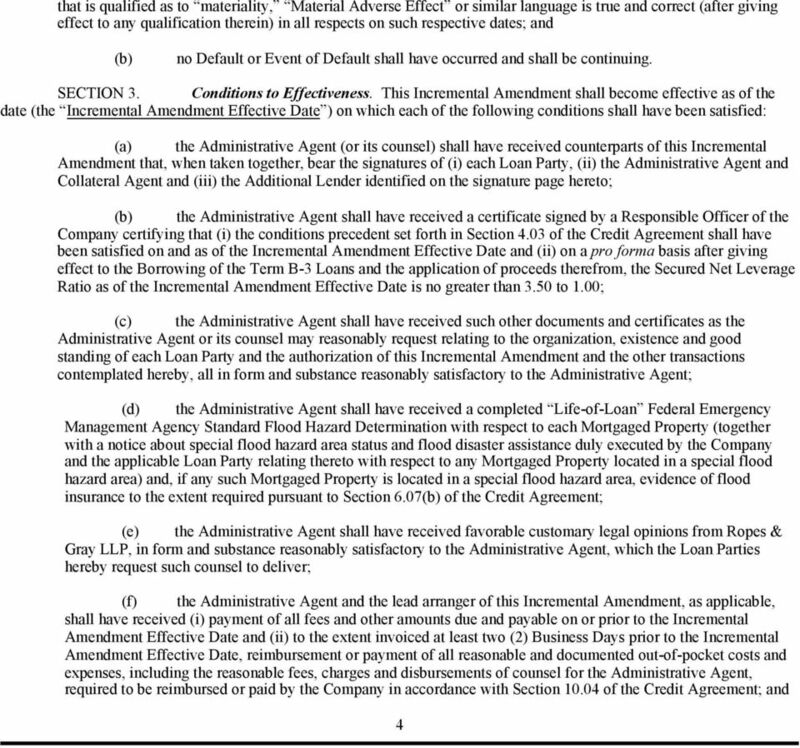 The Borrowers hereby waive diligence, presentment, demand, protest and notice of any kind whatsoever. 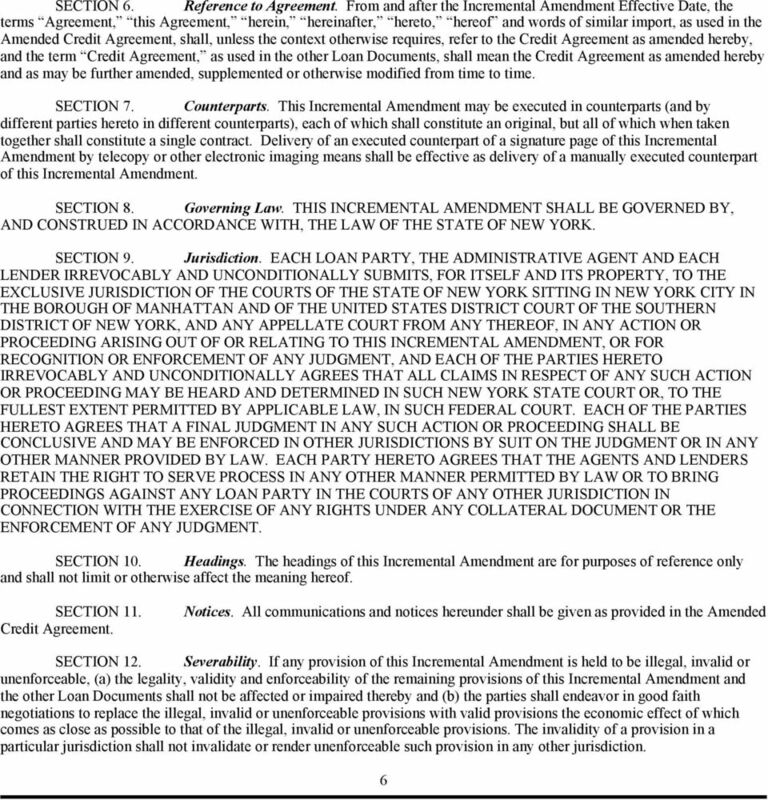 The non-exercise by the holder hereof of any of its rights hereunder in any particular instance shall not constitute a waiver thereof in that or any subsequent instance. 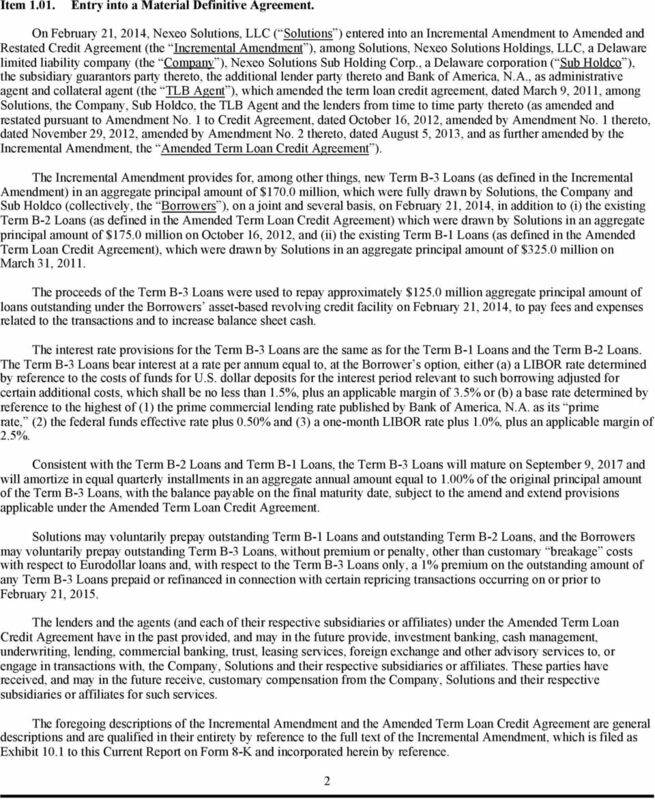 All Borrowings evidenced by this note and all payments and prepayments of the principal hereof and interest hereon and the respective dates thereof shall be endorsed by the holder hereof on the schedule attached hereto and made a part hereof or on a continuation thereof which shall be attached hereto and made a part hereof, or otherwise recorded by such holder in its internal records; provided, however, that the failure of the holder hereof to make such a notation or any error in such notation shall not affect the obligations of the Borrowers under this note. 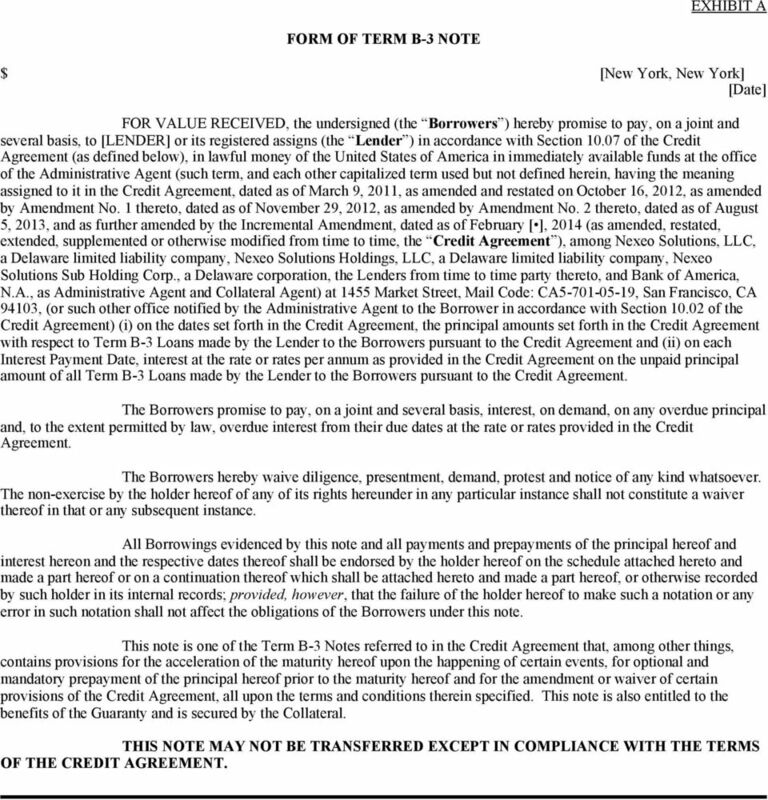 This note is one of the Term B-3 Notes referred to in the Credit Agreement that, among other things, contains provisions for the acceleration of the maturity hereof upon the happening of certain events, for optional and mandatory prepayment of the principal hereof prior to the maturity hereof and for the amendment or waiver of certain provisions of the Credit Agreement, all upon the terms and conditions therein specified. 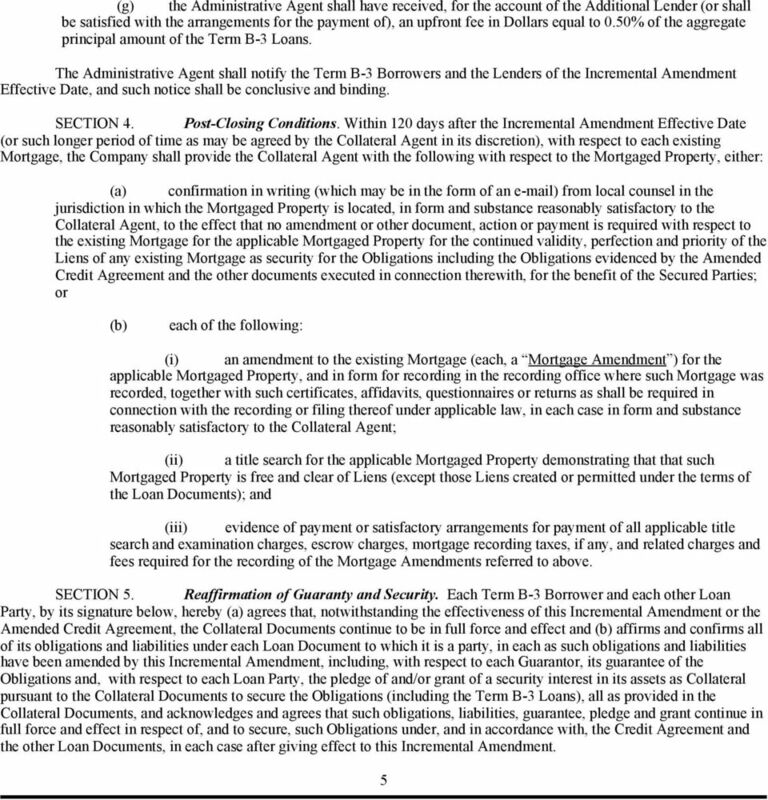 This note is also entitled to the benefits of the Guaranty and is secured by the Collateral. 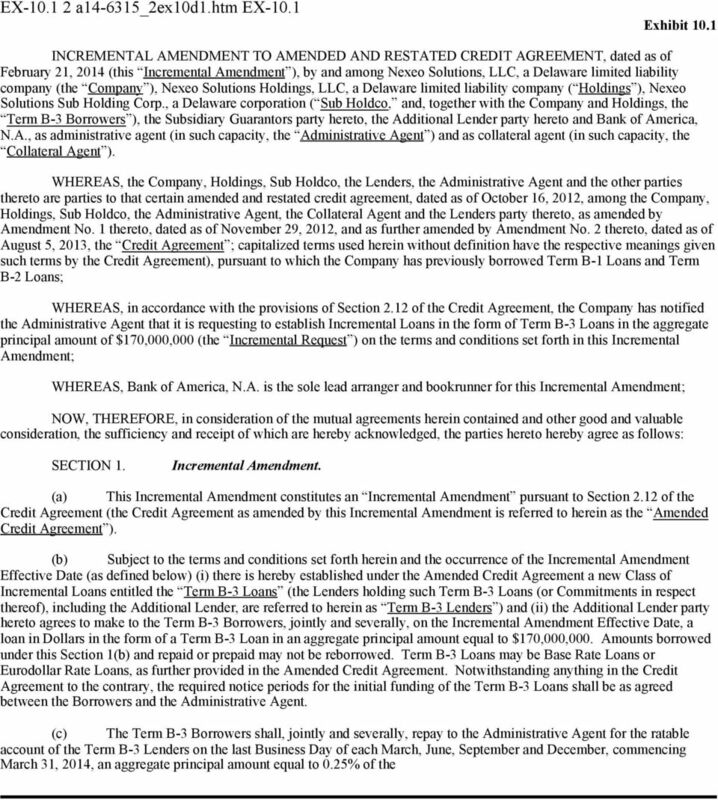 THIS NOTE MAY NOT BE TRANSFERRED EXCEPT IN COMPLIANCE WITH THE TERMS OF THE CREDIT AGREEMENT.